On our first day out in Sri Lanka’s Cultural Triangle, our driver, Raj, took us to Prasanna Hotel and Restaurant. 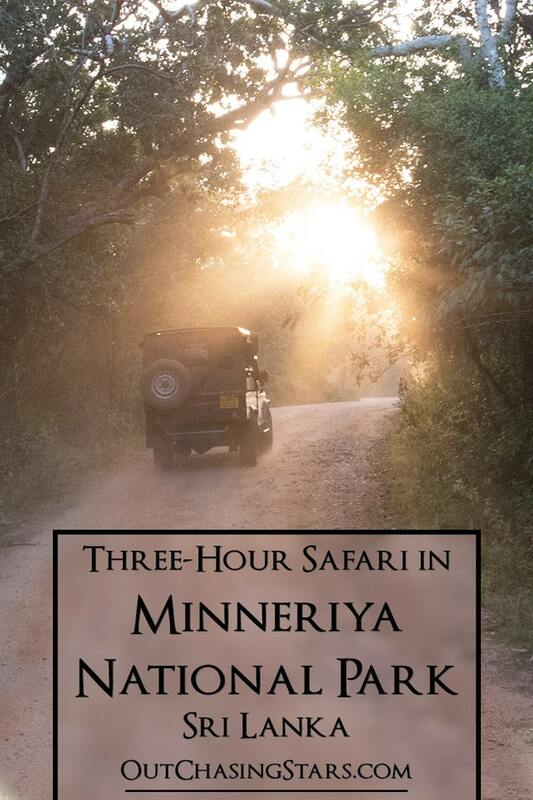 This hotel also operates open-air Jeep tours in the nearby Minneriya National Park. Together with Kaudulla and Wasgamuwa National Parks, this is Sri Lanka’s elephant corridor. Depending on the weather and season, one of these parks might be better to visit than others. 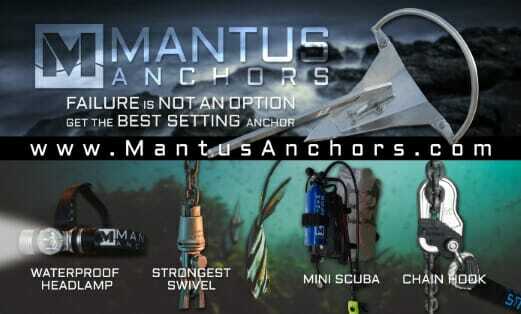 Your guide will know where is best to take you. 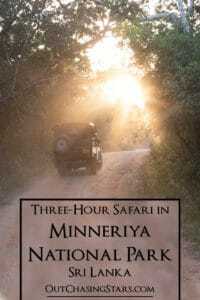 While online Minneriya Parks says May through October is the best time to visit, we went in March and saw plenty of elephants! Minneriya park is home to the largest gathering of Asian elephants in the world. In August and September, the elephants migrate from the other parks into Minneriya, and there can be as many as 700 elephants here. While touring Sri Lanka, we also went to the Wilpattu National Park. There are definitely less elephants in Wilpattu, so I was very glad we had come to Minneriya. We piled into our Jeep with Raj and Kimi and Trevor, the crew of S/V Slow Flight, at about 2:30 pm. It was a short drive to the park. Asian Elephants are smaller than their African counterparts, and Sri Lankan elephants are a subspecies of the Asian elephant. These elephants are less aggressive as well, and that’s why they’ve been trained for logging camps and tourist attractions. Also, although Asian elephants can have tusks, they rarely do – only 2% of elephants do, and they are known as “tuskers”. 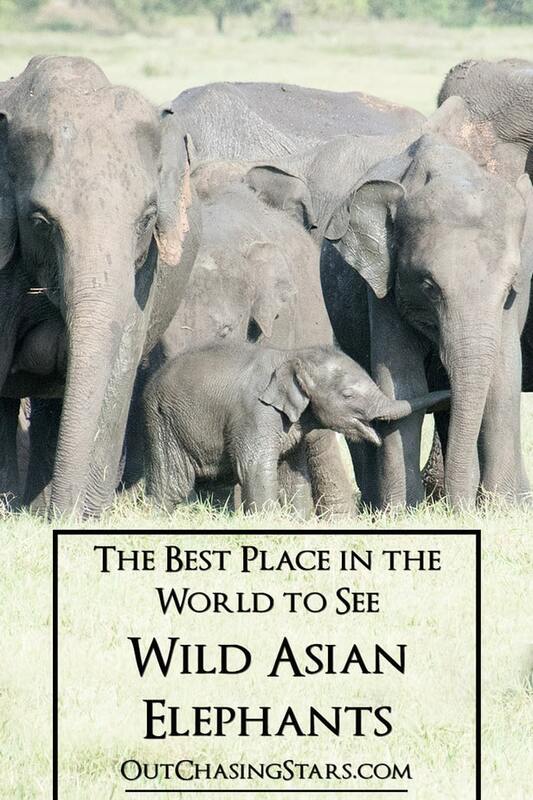 It is believed that the highest density of Asian elephants live in Sri Lanka. While we had just seen (and touched!) Asian elephants at the Phuket Elephant Sanctuary, this was very special in a different kind of way. These elephants were healthy and happy out in the wild. There’s a road running around the park, and it seems that the drivers are not allowed to deviate from the road – which is a good thing. The Jeeps kept a respectful distance from the animals, letting the elephants come up closer if they wanted to. The line of jeeps watching the elephants. A young male elephant, hanging out on the other side of the line from the herd. The male elephant passing through the line of jeeps. Most of the elephants were females, and some even had babies as young as two weeks old! The water was pretty full of water buffalo in some areas. We learned that the water buffalo here are actually hybrids between water buffalo and the local cattle. It’s very rare to find a real water buffalo. We saw so many Indian peafowls (you might know them better as peacocks). 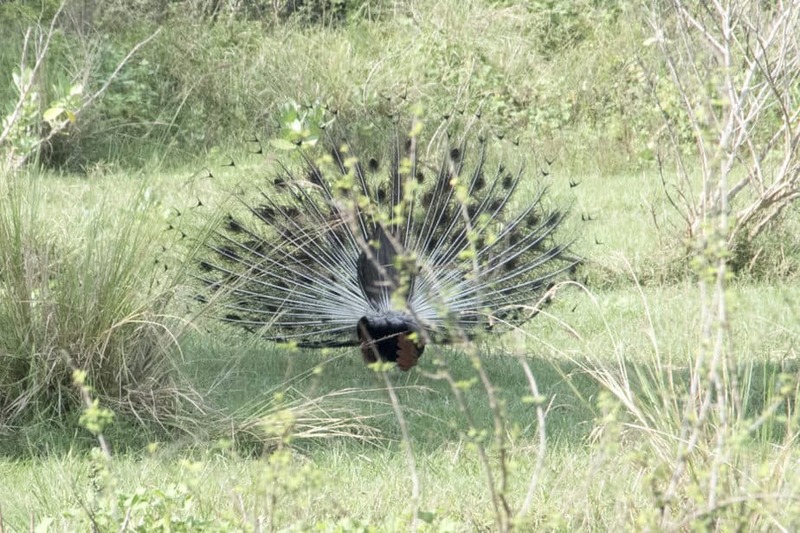 There were many more females (peahens) than males (peacocks), but we did see a few males, including one dancing. We were not his target audience though, so we got the show from the backside! There were many other interesting birds to see at Minneriya Park. Painted Storks. Our guide said the pink feathers are due to the red algae they eat. We had to ford a river a few times and one of the Jeeps got stuck. We were just behind, so our driver helped haul the Jeep out. Minneriya Park was definitely a highlight of our time in Sri Lanka. 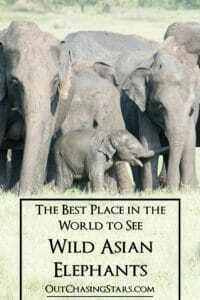 It was an amazing way to see elephants in the wild and we are so glad we did it! That baby elephant is so adorable! Beautiful photos. Thank you! Yes, we had a great time in Sri Lanka.